Scientists at MIT may have just transformed the way we eat our condiments forever. PhD candidate Dave Smith and his team of mechanical engineers and nanotechnologists have created a new condiment lubricant call LiquiGlide that makes the inside of a bottle so slippery that the contents effortlessly come out. Smith said LiquiGlide was originally intended to be used to coat car windshields and the insides of gas or oil lines that frequently clog. However it is now being seen almost exclusively with food, particularly Heinz ketchup bottles. Heinz has officially recommended tapping the ‘57’ on the bottle to loosen a clog and get the most ketchup out, but with LiquiGlide this age old wisdom may no longer be necessary. 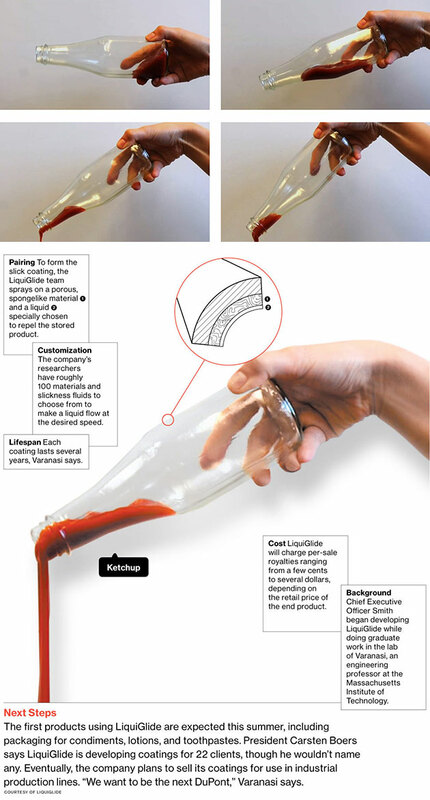 LiquiGlide is super slippery, non-toxic coating that can keep virtually any condiment from sticking to the sides of glass and plastic bottles. Smith describes LiquiGlide as being a kind of structured liquid; rigid like a solid but lubricated like a liquid. The substance can be applied in many different ways, including spraying the coating onto the inside of bottles. Now even the densest substances slide right out of LiquiGlide coated bottles with ease. One of the greatest challenges Smith and his team faced was ensuring that the coating was completely non-toxic and safe for food. They went about this by using only materials that had been approved by the FDA. After finally coming down with a formula, the researchers heavily patented it. At first condiments seemed like a narrow focus for the team, but the market for condiments is over $17 billion dollars and the scope of LiquiGlide could have far-reaching consequences for food consumption. Smith estimates that is all these bottle used LiquiGlide the product could save about one million tons of food from being thrown out annually. LiquiGlide recently placed second in an entrepreneurship competition at MIT, and won the audience-choice award. Now Smith is in talks with several companies about marketing LiquiGlide, though the team acknowledges that it’s still very early to predict the full implications of this new product.